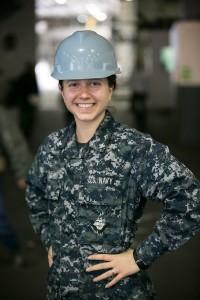 Find out what one Erie native is doing to serve her country abroad. Our city traces a long history of naval service dating back to the War of 1812, and today its citizens maintain an interest in maritime affairs, whether that be in the form of private sailing endeavors or volunteers dedicating their time to manning the USS Brig Niagara. Erie residents have an intimate connection with their waterfront, so it should come as no surprise that some locals extend that relationship to navigating larger bodies of water, and in some cases, even serving our country on the world's oceans. One exemplary Erie native has found her place at sea serving aboard the USS George Washington for the U.S. Navy. Petty Officer 3rd Class Beverly Lesonik graduated Fort LeBoeuf High School in 2010, and since then has made her way thousands of miles from home to her current station at a U.S. Navy base 35 miles south of Tokyo. Lesonik's ship is one of only ten currently operational aircraft carriers in the U.S. Navy, a stunningly massive vessel that stands as a testament to the impressive capabilities of U.S. naval operations. Lesonik is a mass communications expert aboard the vessel who is beholden to a wide variety of responsibilities as the ship travels the Pacific visiting countries like the Philippines, Singapore, and Thailand. Though Lesonik is a long way from home, she takes great pride in her work and finds herself constantly inspired by her surroundings. "I enjoy the appeal of waking up out at sea. It's very beautiful to wake up and see the ocean everyday," said Lesonik in a recent press release. "The Navy offers a good opportunity to gain experiences that no other career option can offer you." A large part of Lesonik's job as a communications expert takes the form of informing the world about what the U.S. Navy does, as well as maintaining connections between sailors and the public back home. In other words, Lesonik serves a critical role in maintaining awareness of the hard work our naval personnel are doing out at sea to keep our country safe. And while this job is a far cry from the work of our soldiers on the frontlines across the world, the USS Washington's operations are critical to maintaining peace at sea. So as our military personnel throughout the world are always in our thoughts and prayers, it's always a point of pride to commend the efforts of those hail from our city and its history of naval service.